Author Bev Ashford was disgruntled that there was not just one book with all the required information to assist her students in learning about textiles. Ashford decided to fix this problem by writing her own textbook, “Fibres To Fabrics” (published by AuthorHouse UK). Within this book, Ashford provides details on how fibers are formed, their unique properties and how they are spun into yarn. She then shows how these yarns are used to make a variety of fabrics. The book outlines the process of dying fabrics and applying different finishes for performance or aesthetic purposes. “Fibres To Fabrics” is presented in a logical, readable format and features numerous diagrams, pictures and tables to use for comparison purposes and foster understanding. Also included is information regarding evolving fabrics technology, such as modern materials and biotechnology. 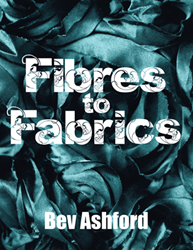 “This book will appeal to readers interested in technical information on textiles – mainly those in education and the textile industry,” Ashford says. Ashford utilizes her experience as a teacher of textiles. As a member of the Textile Institute, Ashford has intimate knowledge of the manufacturing of many fabrics. She hopes this book will help future students, teachers and those working in the textile industry. Bev Ashford lives and writes in East Sussex, England.